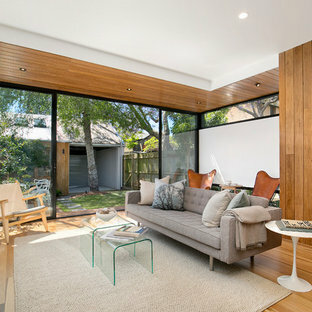 Photo of a mid-sized contemporary enclosed family room in Sydney with white walls, medium hardwood floors, a freestanding tv, no fireplace and brown floor. Inspiration for a mid-sized contemporary dining room in Sunshine Coast with white walls and dark hardwood floors. 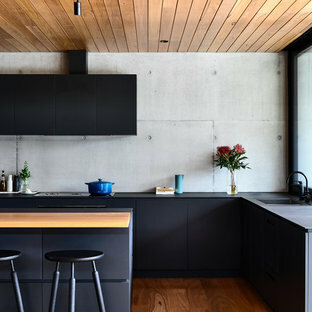 Contemporary l-shaped kitchen in Melbourne with a drop-in sink, flat-panel cabinets, black cabinets, grey splashback, cement tile splashback, black appliances, an island, black benchtop, medium hardwood floors and brown floor. 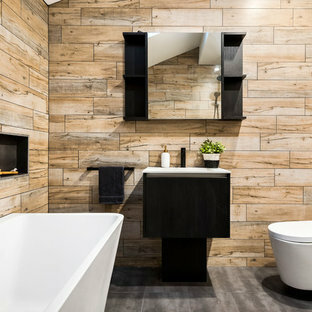 Design ideas for a contemporary bathroom in Melbourne with flat-panel cabinets, black cabinets, a wall-mount toilet and brown tile. 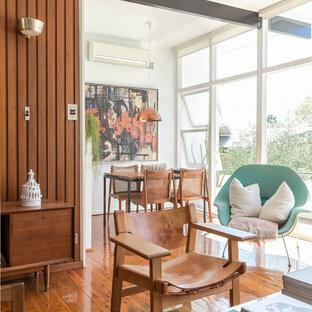 This is an example of a modern open concept living room in Sydney with white walls and medium hardwood floors. 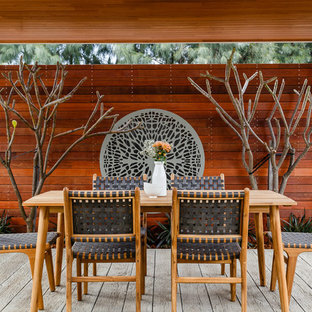 This is an example of a mid-sized contemporary backyard deck in Perth with a pergola. 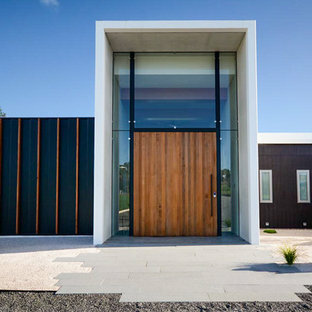 Inspiration for a contemporary backyard patio in Brisbane with an outdoor kitchen, concrete slab and a roof extension. 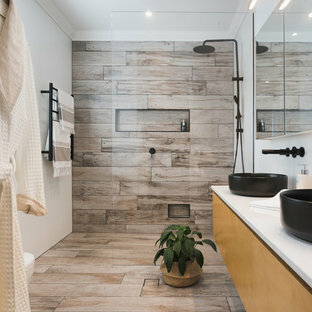 Inspiration for a contemporary 3/4 bathroom in Brisbane with flat-panel cabinets, light wood cabinets, an alcove shower, white walls, a vessel sink and beige floor. Modern galley eat-in kitchen in Melbourne with flat-panel cabinets, white cabinets, grey splashback, stainless steel appliances, light hardwood floors and an island. Inspiration for a contemporary master bedroom in Brisbane with grey walls and carpet. Design ideas for a large modern kitchen/dining combo in Sydney with concrete floors, grey floor and white walls. Inspiration for a tropical master bathroom in Perth with open cabinets, brown cabinets, a freestanding tub, white walls, dark hardwood floors, a vessel sink and brown floor. Inspiration for a mid-sized contemporary wood straight staircase in Sydney. Design ideas for a contemporary kitchen/dining combo in Melbourne with white walls, medium hardwood floors and brown floor. 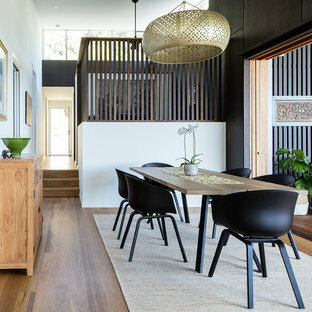 Contemporary dining room in Perth with grey walls and light hardwood floors. 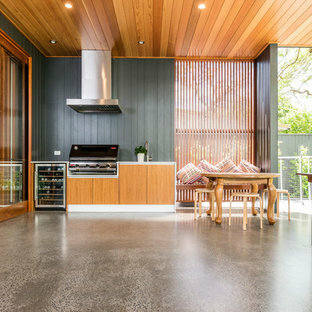 Inspiration for a contemporary backyard patio in Perth with an outdoor kitchen, tile and a roof extension. This is an example of a small transitional one-storey white exterior in Brisbane with wood siding and a hip roof.